Purpose: To assess the effects of amiodarone and diltiazem on atrial fibrillation (AF) induced atrial electrical remodeling and their clinical implications. 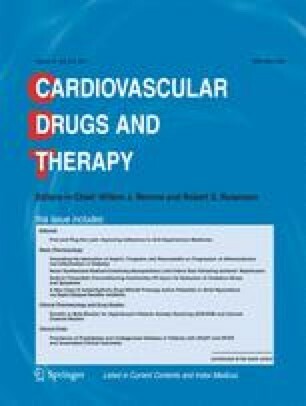 Methods: Persistent AF patients were randomly assigned to three treatment groups over a period from 6 weeks before to 6 weeks after internal cardioversion: group A (35 patients, oral diltiazem), group B (34 patients, oral amiodarone) and group C (37 patients, no antiarrhythmic drugs). Several electrophysiological parameters were assessed 5 min and 24 h after cardioversion. Results: Compared with controls, group B patients had significantly higher conversion rates (83% vs. 100%, p = 0.041) and a higher probability to maintain sinus rhythm (p = 0.037). Patients of group B had longer fibrillatory cycle length intervals than patients of group A and C (180 ± 18 ms vs. 161 ± 17 ms vs. 164 ± 19 ms, p = 0.001) and longer atrial effective refractory periods (211 ± 22 ms vs. 198 ± 16 ms vs. 194 ± 17 ms, p = 0.003) as assessed 5 min after conversion. Post-conversion density of supraventricular ectopics was significantly lower in group B compared to groups A and C (p = 0.001). Conclusions: Oral amiodarone increases conversion rates, prolongs fibrillatory cycle length and atrial effective refractory period and preserves sinus rhythm after cardioversion in persistent AF patients by suppressing the atrial ectopics that trigger AF.